What does it take to perfect a flawless éclair? A delicate yet buttery croissant? To pipe dozens of macarons? The answer is: an intimate knowledge of the fundamentals of pastry. In The Art of French Pastry award-winning pastry chef Jacquy Pfeiffer, cofounder of the renowned French Pastry School in Chicago, gives you just that. Pastry is all about precision, so Pfeiffer presents us with an amazing wealth of information—lists of necessary equipment, charts on how ingredients react in different environments, and the precise weight of ingredients in grams, with a look at their equivalent in U.S. units—which will help you in all aspects of your cooking. But in order to properly enjoy your “just desserts,” so to speak; you will also learn where these delicacies originated. Jacquy Pfeiffer comes from a long line of pastry chefs and has been making these recipes since he was a child working in his father’s bakery in Alsace. Sprinkled with funny, charming memories from a lifetime in pastry, this book will have you fully appreciating the hundreds of years of tradition that shaped these recipes into the classics that we know and love, and can now serve to our friends and families over and over again. The Art of French Pastry, full of gorgeous photography and Pfeiffer’s accompanying illustrations, is a master class in pastry from a master teacher. Jacquy Pfeiffer's career began with an apprenticeship in Strasbourg, Alsace, at the famous Jean Clauss Pâtisserie. In 1995, Pfeiffer cofounded the French Pastry School in Chicago with Chef Sébastien Canonne, M.O.F., where their team is devoted to imparting excellence. Pfeiffer has participated in many of the world’s most prestigious pastry competitions, placing in the World Chocolate Masters in Paris in 1996 and at the Coupe du Monde de la Pâtisserie in Lyon, France, in both 1995 and 1997. He was named one of the Top Ten Pastry Chefs in America by Chocolatier and Pastry Art & Design for two consecutive years and was inducted into the Académie Culinaire de France in 2003. In 2009, Pfeiffer was featured in Kings of Pastry, a documentary by internationally acclaimed filmmakers D. A. Pennebaker and Chris Hegedus. Shortly after, he was inducted into Dessert Professional’s Pastry Hall of Fame and the Chicago Culinary Museum’s Chefs Hall of Fame. Today, Pfeiffer is the Academic Dean for Student Affairs at the French Pastry School, widely considered one of the leading pastry institutions in the world. Martha Rose Shulman is the award-winning author of more than twenty-five cookbooks, including The Very Best of Recipes for Health, Mediterranean Harvest: Vegetarian Recipes from the World’s Healthiest Cuisine, Mediterranean Light, Provençal Light, and Entertaining Light. She writes the daily Recipes for Health column for the online New York Times, is a founding contributor of the website Zester Daily, and is the co-owner of the Venice Cooking School in Los Angeles. She has coauthored books with pastry chef Sherry Yard, Wolfgang Puck, Dean Ornish, and Mark Peel, and has collaborated with the Culinary Institute of America on two books, Culinary Boot Camp and Spain and the World Table. Learn more about Martha at martha-rose-shulman.com. "Jacquy Pfeiffer is a master whose talent and artistry I respect. He has written a book that everyone can enjoy—classic French pastry techniques, presented with Jacquy's twist." "Everyone will love this book because it's more than just a pastry chef giving his recipes—it teaches you about different techniques and ingredients. I've always known that Jacquy Pfeiffer is an incredible teacher and through this book you can learn so much from him. The Art of French Pastry is easy to follow and really a joy to go through and cook from." 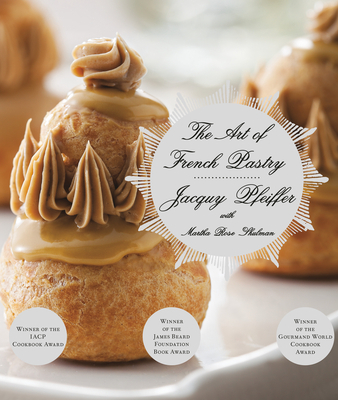 "The Art of French Pastry is a very personal collection of exceptional French pastry recipes collected over many years by Jacquy Pfeiffer, one of the most gifted and respected pastry teachers and chefs. This book is a distillation of all the experiences accumulated over a lifetime and Jacquy is guiding the reader through every technical step, just as if he were standing beside you in his pastry school, making sure that you’re achieving a glorious result! The book is written in the language of memories and can affect your life wonderfully . . . it is a must-read for anyone who wants to understand the art of French pastry!"